Historically, the visit of England to Lansdowne Road was the single most important game of the year. Win, and all else would be forgotten, everything in the garden would indeed be rosy. This year is no different. It is, undoubtedly, Ireland's most important game thus far. Every win elevates the importance of the subsequent outing, and today sees the meeting of the top teams in this year's championship in what should be the defining game of the northern hemisphere's international season. Both are unbeaten and, if Ireland have displayed a controlled and pragmatic efficiency, it's Stuart Lancaster's team that have grabbed the headlines for the attacking prowess of their young Bath-influenced backline. 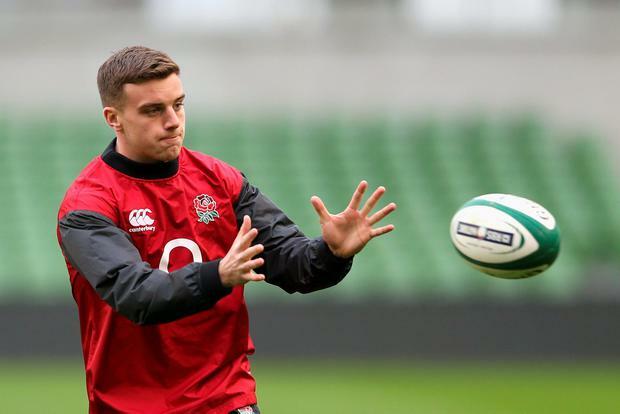 George Ford, occasionally-introduced during November and now settled in for the Six Nations, has impacted significantly on England's game. An excellent footballer and an attacking number 10 in the traditional sense, he performs the game's basic skills superbly. If small of stature, he's by no means shy of attacking the gainline prior to releasing his Bath clubmates Jonathan Joseph and Anthony Watson, whose introduction has provided an offensive capacity unseen in an English team for many years. For all of his virtues as a coach, however, it isn't unreasonable to suggest that these selections were forced on Lancaster at the beginning of the championship by injuries to the likes of Brad Barritt and Manu Tuilagi; otherwise it could very well have been the usual blunt English instrument that we'd be seeing today. The injury to fullback Mike Brown, one of the 2014 tournament's standout players and a key man for Lancaster, is a blow but in Alex Goode they possess a competent and composed replacement. Similarly, Jack Nowell should have little difficulty stepping up in place of Jonny May on the wing. If their backs have been garnering the headlines, the forward control shown by Chris Robshaw and his pack has been impressive. Without second-rows of the calibre of Tom Palmer, Courtney Lawes and Geoff Parling, the unit have been effective in every facet, with the scrum a particular weapon. Billy Vunipola and a rejuvenated James Haskell will cause problems too with ball in hand. Noises from the English base last week were unsurprisingly respectful towards Ireland. Jonathan Sexton, Conor Murray, and Paul O'Connell attracted most praise and it was evident that the match is being seen for just what it is: the key game of their season, away to the reigning champions. There's no denying the impact of the loss of Jamie Heaslip but the timely re-emergence of Seán O'Brien provides some consolation. It's a tough ask of Jordi Murphy to step in once again, and it will be a major step up in quality and intensity from what he experienced in Rome, but he's been around the squad long enough now to be entirely comfortable and Vunipola will hold no fears for him. The major selection decision faced by Joe Schmidt, apart from who would replace Heaslip, would have been Jack McGrath or the fit-again Cian Healy at loosehead. Healy has traditionally had the upper hand over Dan Cole, and many thought that he would get the nod again. McGrath, however, retains the coach's confidence and brings a season's worth of hard graft into what is sure to be a mammoth scrummaging battle. The Irish kicking game has been one of the tournament's features thus far. It doesn't always make for pretty viewing but the accuracy of Sexton and Murray, combined with the aerial abilities of Simon Zebo, Tommy Bowe and Rob Kearney, are major weapons in the arsenal. Their capacity to gain possession, territory, and turnovers from this facet of play is key to the Irish performance. We've been speculating for a while now as to when we might see more incisiveness from Ireland with ball in hand and, even allowing for the strength of the English defence, progression can be expected today. Robbie Henshaw and Jared Payne are settling well together with Henshaw, in particular, already a key performer. This will be a massive physical battle, hopefully devoid of the violence which marred the French game. The English, as they do, will look to grind Ireland down and provide a platform for Ford, Joseph, et al to do damage; Joe Marler will target Mike Ross relentlessly too in a propping duel that will be anything but a sideshow. For Ireland, the plan will be more controlled. Lineout and maul will be crucial to success, as will the accuracy of their kicking game, but expect Schmidt and Sexton to pull a rabbit or two from the hat to challenge that tight defence - the outcome could hinge on it.